Be Pranic presents: 3 days with Master Tao. Qi gong exercises to establish internal vision, anatonomy of internal viewing, deep relaxation, traveling trough the body. How to learn to enter into a calm state, focus on your propose. All this in march 15, 16 en 17. 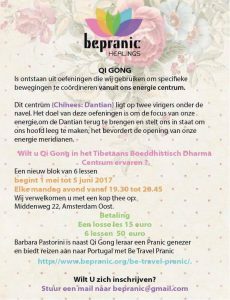 Book your place bepranic@gmail.com. If you like to joind the 3 days the total price is 180 euro. 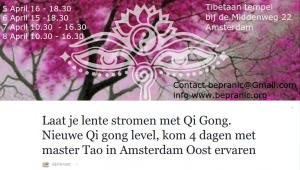 Laat je lente stromen met Qi Gong. Nieuwe Qi gong level, kom 4 dagen met master Tao in Amsterdam Oost ervaren, 5 tot 8 April 2018. 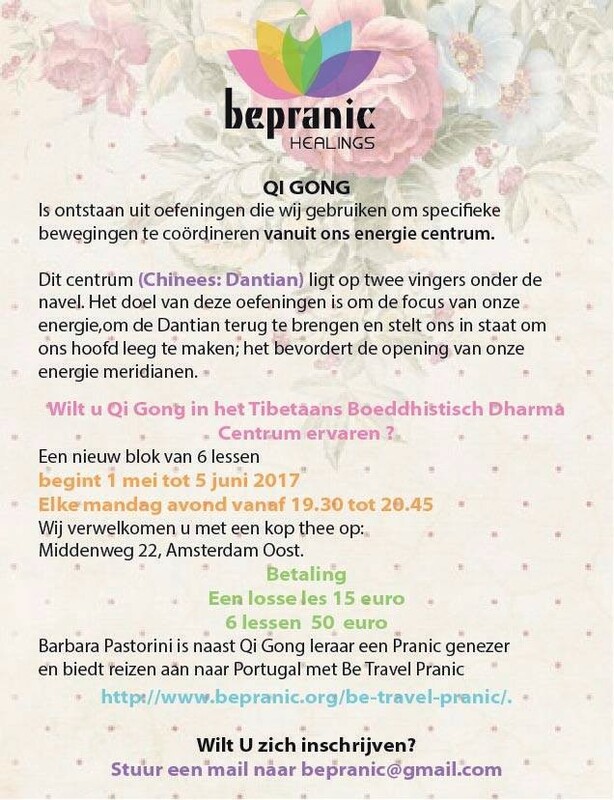 Wil je ons vergezellen op het qi Gong voorjaarsevent? 5 tot 8 April is master Tao hier in Amsterdam voor een extra “level”uitleg: BODY& MIND en interne orgaan te kunnen genezen en met simpel oefeningen leren om ook thuis weer lichaam in balans te brengen. Raad eens welke meridiaan de grootste impact heeft in het voorjaar? Samen zullen we de functies en de remedie van het handhaven van de lever meridiaan ontdekken. Als je het interessant vind laat het weten. 120€ en als je snel boekt is – 105€ voor 4 dagen inclusief lunch. Losse dagen zijn ook mogelijke te boeken, 45 euro per sessie. te boeken tot 20 maart. Na 21 maart is het te boeken voor 55 euro per sessie. Ik zie jullie bij de tempel HAOLA! Lets spring with QI gong! Guess which meridian has the greatest impact in spring? Together we will discover the functions and the remedy of maintaining the liver meridian. If you find it interesting, let us know. 120 € and if you book fast – Until 20 march, 105 € for 4 days including lunch. Separate days are also possible to book, 45 euros per session. I see you at the temple! 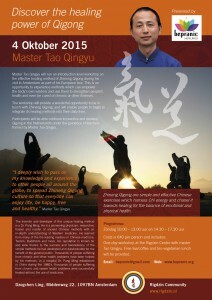 Dear Qigong lovers I’m proud to invite you to the Qigong workshop with Master Gao in Amsterdam! October 2017! 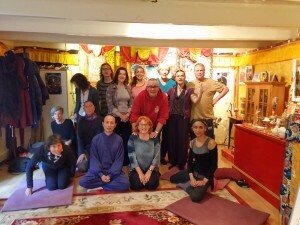 Place of practice: The seminar will be hold at De Tempel -Tibetan Tempel in Amsterdam Oost, Middenweg, Amsterdam. On sunday we will be at the park Frankandaal in Amsterdam Oost, if the weather permits. 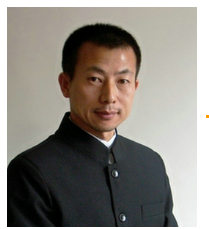 Master Gao did work in Huaxia Zhineng Qigong Center for 7 years, and served successively as the “Center” office secretary, Teacher Pang’s private secretary, the director of “Center” human resources, the leader of the Editorial Dep artment and the Correspondence Teaching Department. In 2000, he had to leave when the “Center” disbanded. After that, he had to engage in non-Qigong job, including magazine editor, human resources manager, self-employment, etc., until the end of 2009, he began to try the new way of development of ZNQG. more info.. Gao. We will have a great opportunity to meet Gao and his special gift. He will focus on how to balans our body mind and spirit state. He will bring us to a welness state, and we will bring back home new technics on how mantain our self in a good Harmony state. Qi qong exercises with tools to harmonize the body , realese the stress, will cost 45 euro for one day or 80 euro for 2 days. The sunday will be on donation bases ( raccomended 12 euro pp),f we will be in the outdoor, you can bring friends and start to practice Zhineng QI gong and the warming up of the 2 days workshop. The Sundays if rains we may have special inside place, more to come. !!! 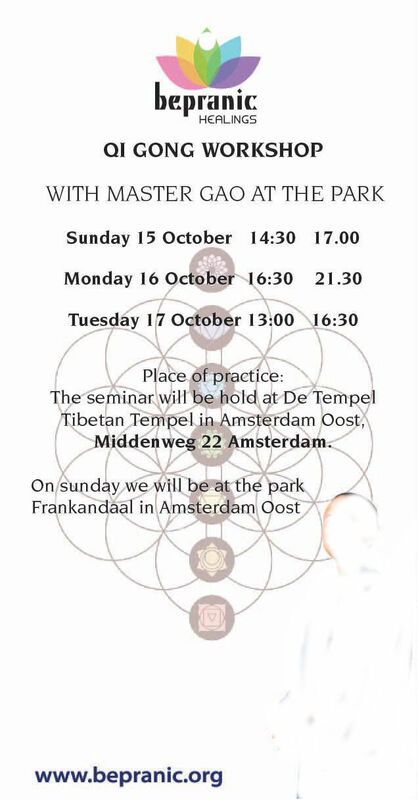 Private Sessions with master Gao are also possible at De Tempel – during the those days. One session of 30 minutes will be 20 euro. For sign up or for more info you can contact me per mail bepranic@gmail.com or call me at 0650966309. 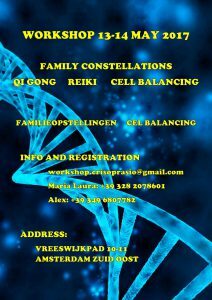 We will have the opportunity to experince the family costellation in combination with Reiky, Cell balancing and Qi Gong, mail bepranic@gmail.com I will send you all the info, check the flyer below to get first impression. I like to inform that the location did change. We will welcome you at the Wisseloord 175 avenue in Gein. AT 17 o clock we will start the QI Gong session. Later we will experience the family Costellations. Dear people spring is slowly increasing and our biorhythm responds, along with QI Gong we harmonize our energy balance for a fit body and for a bright head. 1 May will start a new block of 6 lessons where we will have the oportunitity to work around our Dantien. Streching excercises and free movements will help to increase awarness of your inner energy centra. I see you in the temple. March 2017Afternoon with Master Tao, Amsterdam @ temple Middenweg 22, Amsterdam and Park! Time 30 march 2017 13 o’clock until 15 p.m. If the sun is shining we can go to the park. Please confirmation is welcome, but you can enjoy as well last minute. The cost will be 10 euro p.p. Great opportunity to meet and spend time to practice the wise teachings of Master Tao. Tibetan Craft made from Anish Kumar. All paintings are available for sell. We will go deeper in de the method of pouring QI in our Bodys with the Lift QI Up and Pour Qi down methode. system, disease curing as well as enhancing body and mind functioning. It is also very good for liver, kidney and spleen. spending only a short time in qigong exercise every day. 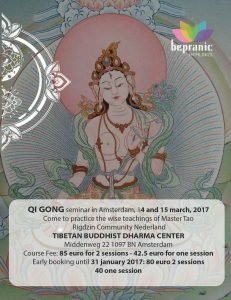 Do not miss this occasion learn and practice together with Master Tao, therefore set up your early agenda of 2017 and see you in the temple. Haola! with bio lunch and coffe/ thee break. The schadule times depend on Teacher Gao but will be approximately from 10.00 to 12.30 and from 14.00 to 18.00 / 18.30 hrs. Will be served a nice bio lunch, coffe and thee. Please any doubt about prices or availability you please contat me directly, We are all one we like to share the Qi Field! 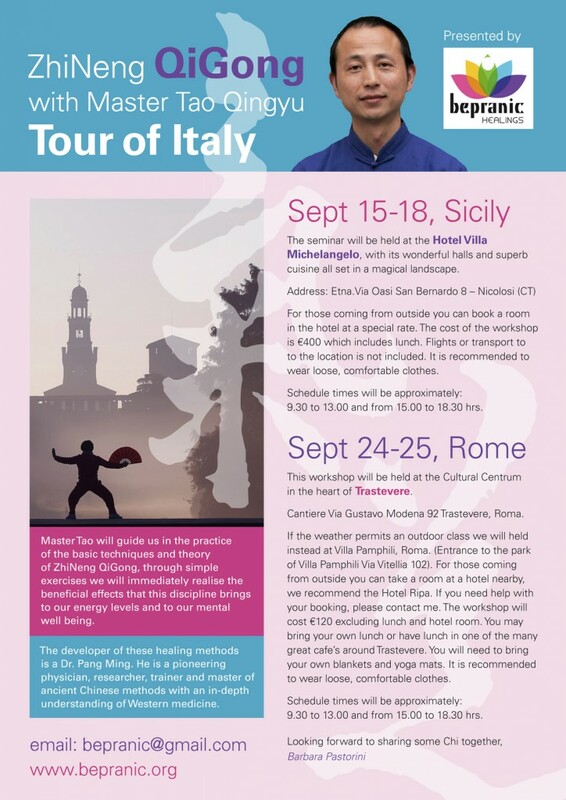 PLACE OF PRACTICE: The seminar will be held at the Hotel Villa Michelangelo: The Hotel Villa Michelangelo It will be the beautiful setting with its wonderful halls, its superb cuisine and the magical landscape. Etna.Via Oasi San Bernardo 8 – Nicolosi (CT). For those coming from outside you can take a room with breakfast in the same hotel, with special rates, in fact possibly let me know that I’m going to talk to the italian organizators . The entire workshop will cost € 400.00 including use of the / of the rooms for the workshop and lunches. You can book your own flight, and is not included in the price. To attend the seminar is recommended to wear comfortable clothes. The schadule times depend on Teacher Tao but will be approximately from 9.30 to 13.00 and from 15.00 to 18.00 / 18.30 hrs. PLACE OF PRACTICE: The seminar will be hold in a best cultural centrum in the heart of Trastevere. The entire workshop will cost € 120 excluding lunch – hotel room. you can bring your own lunch of have lunch in the bars around Trastevere. You can book your own flight. The schadule times depend on Teacher Tao but will be approximately from 10.00 to 13.00 and from 15.00 to 18.00 / 18.30 hrs. In those days the Master Tao will guide us in the practice of the basic techniques and theory of Zhineng Qigong, through simple exercises, allowing us to immediately notify the beneficial effects that this discipline involves both energy level and at the mental level. 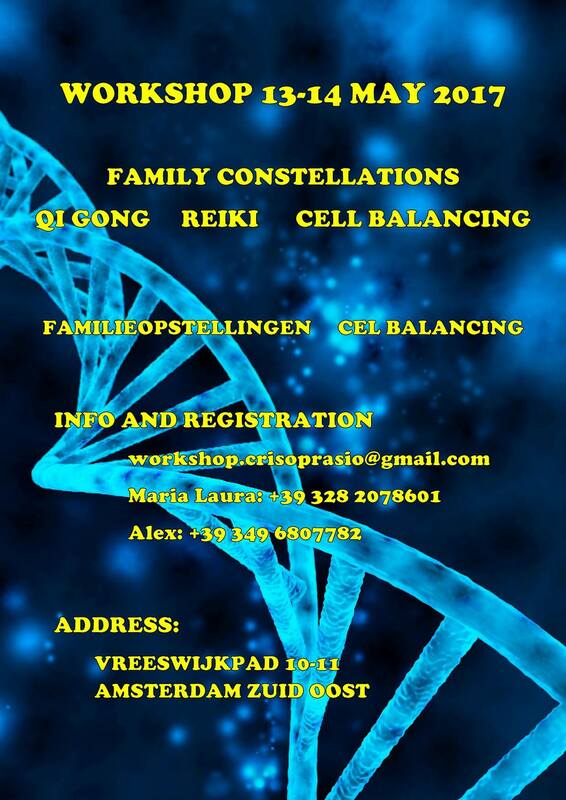 4 & 5 June Qi Gong workshop in Amsterdam. 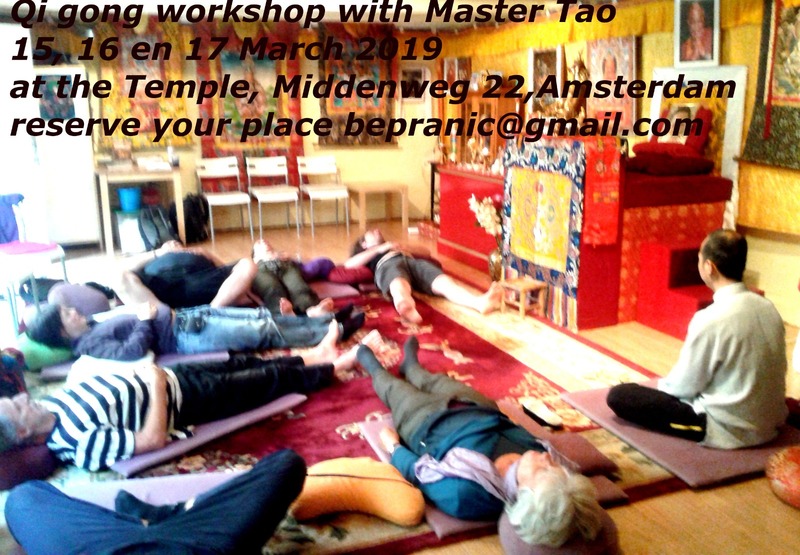 I’m really proud to let you know that 4 & 5 June Masters Tao and Ye will give a 2 days Zhineng Qigong workshop in Amsterdam Oost, in the Temple. Thanks to your enthusiasm from the last times, I’m really happy to invite you all to partecipate. Masters Tao and Ye will spend time on explain and guide us to experience our Lower dantien, our energetic centra. How to stay strong in your QI field and how to mantain focus. They will dedicate time on how we can use qi to heal our bodies. This opportunity will be a way to maintain our qi level high. The workshop will be filled in with practical exercises and theory about the Entirety theory. The energy of the Masters are really soft and in the same time really pure and strong. Tao and Ye are both very experienced Zhineng Qigong Masters. They are trained by Dr. Pang Ming and they have worked several years in the Huaxia center. They are very area dedicated and certainly also have humor. Is for us a way to mantain our mind focus and to keep our qi body alive and balanced trough al the summer.. Thanks to the practice you will be able to be in your qi body every day. 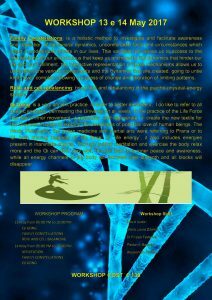 The workshop is good for experienced partecipants and for who likes to discover Qi Gong. Location Tibetan temple, Middenweg 22, Amsterdam Oost. 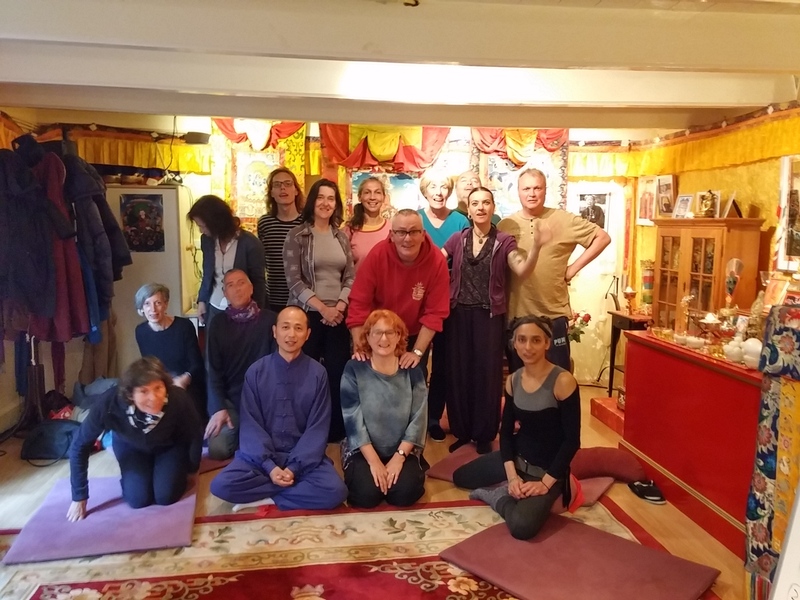 This is a special offer that we can only make thanks to the Coordinators of the Temple and to our Masters that will come back in Amsterdam in order to make our QI field pure and bigger. We merge our intentions in order to develop a balance and harmony state and permit our Qi to flow freely in our bodies. In order to book the early booking I like to invite you all to come and sign up in the temple by Monday 3 April . 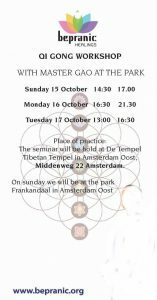 I will be in the temple (http://www.rigdzin.nl/) from 19 to 21. You can send as well an email to me for early booking from now on until 9 april. Cancellation policy: if you really need to cancel the reservation, as well last minute, I like to offer at least 10 euro to the Masters as donation, it results that in case of annulation you will gently donate 10 euro to the masters. Master Tao and teacher Ye are both students of Dr. Pang Ming-pioneering physician, researcher, trainer and Master of ancient Chinese methods with big understanding of Western medicine. Zhineng qigong is an amazing method for bringing benefit to self and others. Good news! After the success of the Qi gong workshop held on October 4, 2015, this year, Tao will again give a Zhineng Qigong workshop. His wife Ye, also a very experienced qi gong master, will be co-teaching. This year we train how to build a strong qi field. We pay special attention to increase the strength of the lower Dantian. We also have special exercises to understand how to stay in your own center and to learn how to manage your own qi field. Help to find the way to stay closer to yourself, to make thoughts and emotions get less hold over you. This will take you to experience a deeper peace and strength. The workshop is interesting for advanced users and is also good for beginners who want to gain experience with Zhineng Qigong. 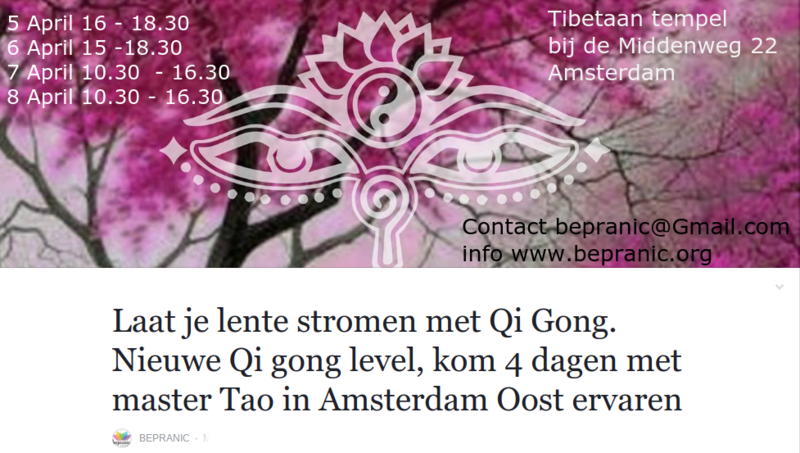 BePranic Presented on the 4 of oktober 2015 in Amsterdam 1 unique day together with Master Tao Qingyu, discovering the power of healing with Qi kong and with the healing method of Zhineng Qigong. The Master Tao Qingyu will arrive in the Netherlands during October. Tao Qingyu , is coming to Amsterdam for a special visit, during which he will run workshops on the effective healing method Zhineng Qigong. This is the opportunity to experience the method and empower the body’s wisdom for everyone who wishes to strengthen his/her health and be cured of chronic or other illnesses.The workshops will provide a wonderful opportunity to be in touch with Zhineng Qigong, and this familiarity will constitute basic contact with the method.For many years now, the many advantages of healing by integrating and using the body’s strength and consciousness has been investigated.